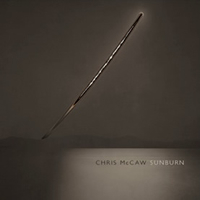 Chris McCaw’s new (and first) monograph, Sunburn, is perhaps my favorite photobook of 2012. It is generous in size, elegantly designed, beautifully printed — and the images are truly awe-inspiring. McCaw has always loved to play with alternate processes for making photography. When I first met him in 2004 he was making large platinum palladium prints from 35 mm photos of 1960s’ rock stars in concert; he was also building his own cameras that he could take on skateboard adventures in strange places. Over the years, he has continually pushed the boundaries of what a photograph can be. McCaw came upon an unusual technique of making long exposures of skyscapes and landscapes quite by accident. During a camping trip, he had set up his large-format homemade camera to capture the arc of stars moving across the night sky over the course of several hours. He opened the shutter on his camera after the sun had gone down, and set his alarm to wake himself up before dawn so he could close the shutter on that single long exposure. The trouble was, he overslept, and woke up after the sun had already risen — essentially ruining that attempt to make the picture he had in mind. Nevertheless, he developed the film to see what, if anything, was there. 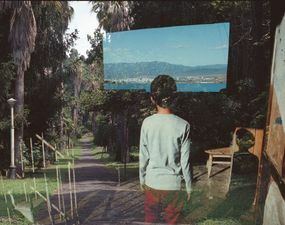 He was amazed to find that the negative had a long thin curved hole in the middle, where the bright sun had burned an arc directly into the film with its focused heat. Sometimes your best ideas come from being open to the possibilities that accidents expose. Since then, he rigorously tried various methods and timings, and he got to know — intimately — the movements of the earth in relationship to the sun and moon and stars. So what we have in Sunburn, are brilliantly calculated exposures of the sun over different horizons, forming various shapes of arcs depending on the camera’s location on the planet, and the time of year. 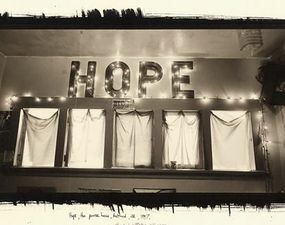 They are made on large-format silver-gelatin printing paper (some as large as 30 x 40 inches), and each photograph includes more-or-less realistic photographic landscapes that look like solarized negatives, with skies that have been burned directly by the sun. And of course, each paper print is a one-of-a-kind photographic sculptural object. Yet it’s not a fixed formula that he repeats. Some are single long exposures. Some are multiple shorter exposures (capturing the single sun as a series of dots burned into the sky). Others show a burning gash in the sky, only to be interrupted by a patch of cloud cover, with the burning gash returning again on the other side of the clouds. Some of the most magical and mind-boggling images are those that stretch across three separate paper negatives, sketching the arc of the sun on a single day — rising, hovering, descending — all over the same precise landscape. Since each image is a unique, one-of-a-kind object, the only way to really appreciate them is to see the originals in a show at a gallery or museum — or to own this book, which I highly recommend. Editor’s note: See some of McCaw’s earlier work, and listen to this audio interview with Chris McCaw, which we made at his studio in San Francisco in 2004. Buy the book directly from the publisher, or via Amazon. 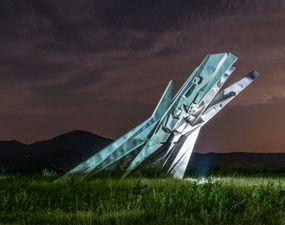 Massive monuments raised by the former states of Yugoslavia praised the successes of a more egalitarian, antifascist society. Recent developments, however, question how much progress has really been made. 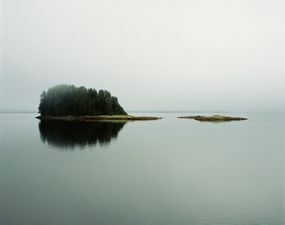 Step into these rich, contemplative landscape photographs and feel yourself drawn away into the wordless beauty of the natural world. An intimate project between two friends, “Broken Sea” uses photography as a means to overcome now-closed political borders, producing a deeply personal reverie, bringing past and present together in every frame. 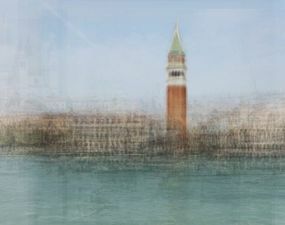 Conducting online keyword searches for famous monuments, Swiss/French artist Corinne Vionnet culled thousands of tourists’ snapshots, and weaved together small sections of the appropriated images to create layered, ethereal structures. 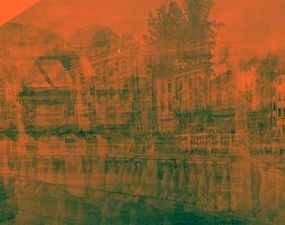 Austrian photographer Yenny Huber compresses city “landscapes” into dense overlapping images, all layered in-camera with film.